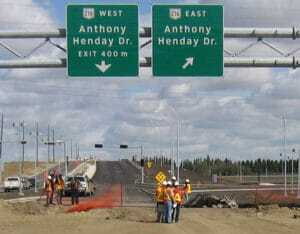 Edmonton’s Anthony Henday Drive was the first P3 project in Alberta. The province estimated that it would take 30 years to complete, so it needed to be done in stages. This particular section of the ring road was the southeast quadrant running from Highway 2 to the Sherwood Park Freeway. Our work for this part of the project would cost $2.3 million over three years. The province bid out each section of the project separately. We landed the sign component with a package no other company could offer: both manufacturing and installation. We’d previously done signage for another quadrant of the Henday, and we were confident that our team could handle this, too. The general contractor for the project was PCL, a company well-known for their focus on safety and quality. Before this project, it wasn’t our regular practice to submit a QA/QC or safety manual. Because of the project’s size and PCL’s concerns about the overall quality of work, they wanted to know every step of our process. This ended up making a big difference in the way we structured our work. We met with PCL several times to share our traffic control expertise and coordinate operations. We also worked with sub-contractors like 3M, Lafarge, Sureway, and Canem. Whenever PCL opened a bridge or redirected traffic to a new location, we were there to make sure the process ran smoothly. We covered every aspect of the project, from traffic management and sign installation to regular road work and on-street maintenance. The sign portion of the project was partly needed to detour around the structure. The Henday crossed over existing roads, so we needed to move northbound and southbound traffic to build further. We temporarily diverted the road on 17 Street, where the bridge was being built, and had signs in place for several years. Our portion of the project took place during a long, wet spring. The window of opportunity to put up signs was rapidly shrinking from nine months to four. The installation company didn’t feel this was enough time, but it was our job to put the signs up within the time available — no excuses. There was some rushing at the end, as with all construction projects, but our portion of the job was finished on time. Watching the new road open was an amazing sight. It might seem simple, but there was a huge amount of coordination involved. The signs were all covered during construction, and the road could only open when they were uncovered. 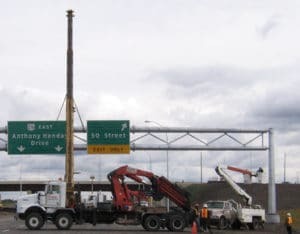 In fact, the signs were so important that they were featured on the cover of that year’s Alberta Roadbuilders & Heavy Construction Association registry. Our attention to safety and due diligence made the project take a bit longer, but it ran smoothly and without any major worker injuries. Our work also helped PCL finish on time. Most other P3 components last much longer than they’re supposed to, and cleanup can take a long time. We had a great working relationship with both the general and the sub-contractors, and the project turned out well as a result.